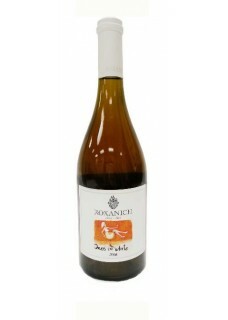 This orange wine is named after the winemaker’ s wife, Ines, and is made from a blend of equal parts Sauvignon Blanc, Vermentino, Glera, Riesling Italico, Friulano, Pinot Gris, and Pinot Blanc .Orange wine is made by macerating the skins of white grapes with the wine for an extended period of time. The maceration time for this wine is over three months. Bright orange-apricot in color, aromas of honeycomb and hay complement undertones of white pepper and some oxidative notes. This wine shares many similarities with sherry in its flavor profile. Food pairing: chicken stew, grilled squid, and barbecued meats.